If your child is consistently underachieving in the area of reading and spelling, complains of words “jumping around” or moving on the page, or has problems with concentration at school (especially with respect to literacy), then there may be grounds to wonder whether he or she has dyslexia. Achieving a definite diagnosis of dyslexia is often difficult. At some of our practices we provide services which may assist in clarifying the situation, and may offer some therapy. Although aimed primarily at children, the tests described here may also be of benefit to adults who experience symptoms of moving / flickering / shimmering text while reading (a.k.a. "visual stress"). 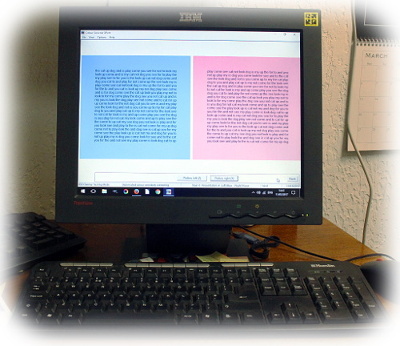 At our Witham, Pitsea, and Corringham practices we have the facility to conduct a computer-based "Colour Screener Xpert" * Assessment. This can reveal whether benefit might be gained from the use of a Coloured Overlay or specially tinted "ReadEZ" spectacle lenses for reading etc. At our Witham practice we also have a highly specialised "Eye Tracker" * computer system which can detect and analyse eye movement anomalies, which may be a contributory factor in specific reading difficulties. These specialised services fall outside the scope of routine NHS provision, and are offered as private supplementary services, for which we charge a consultation fee. N.B. In all cases we strongly advise an up-to-date Standard Eye Examination before advancing to a "Colour Screener Xpert" or "Eye Tracker" assessment. This is a series of advanced tests carried out to investigate possible problems such as Dyslexia and related conditions. It is usually carried out on children, but adults are also welcome to be assessed, and can often benefit from the treatments we offer. It will include a very thorough interview with the patient and their parents to investigate the background to the problems, a full medical history, and a discussion about what educational facilities are currently in place (Individual Education Plan, School Action Plus, etc). There will generally be an assessment of the child's reading abilities, using traditional "Reading Age" type tests, and tests to measure the speed of reading. This will be followed by a series of tests which would not normally be carried in a standard eye examination or sight test, including tests of eye tracking, and an assessment with a Colorimeter to see if the patient would benefit from coloured overlays or glasses. These can then be prescribed as necessary, or the patient may need other help such as prismatic glasses or eye exercises. These tests can be very helpful for children who are struggling at school, and the results can be provided in a report which can assist in obtaining a Statement of Special Educational Needs.